For almost 60 years, Canada’s 1954 bank notes have been a subject of discussion throughout the numismatic community. Detailed lines in the engraving of Queen Elizabeth II’s hair were thought to resemble the face of a devil, leading to notions of controversy within the government and monarchy. The famed “Devil’s Face” was eventually removed from the original engraving, and new bank notes were issued bearing a modified portrait of the monarch. While tales of the source and reason behind this artistic blunder swirl, primary sources reveal that this was in fact a mere coincidence, and may not have been the ‘instant’ controversy that is now taken for granted by collectors. The story of the Devil’s Face portrait for the 1954 bank note series actually began in 1951, when Queen Elizabeth II was photographed by Yousuf Karsh, one of Canada’s leading portrait photographers.1 During the 1951 portrait sitting, Queen Elizabeth was photographed in many poses, in all of which she wore a royal tiara (Figure 1). 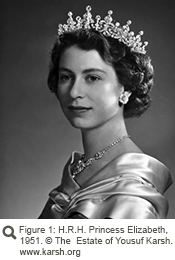 When one of these images was selected for the upcoming series of bank notes, the removal of this tiara was required. Rather than going to the difficulty of having the Queen sit for another photograph, the image was instead sent to Brigden’s Limited (formerly known as the Toronto Engraving Company), a premier engraving and graphic arts firm located in Toronto (Figure 2).2 The skilled artists at Brigden’s retouched the original negative (Negative # 521976), which required the illustration of the Queen’s hair where the tiara once sat.3 It is important to note, however, that minimal retouching was required in the curls around Her Majesty’s left ear. 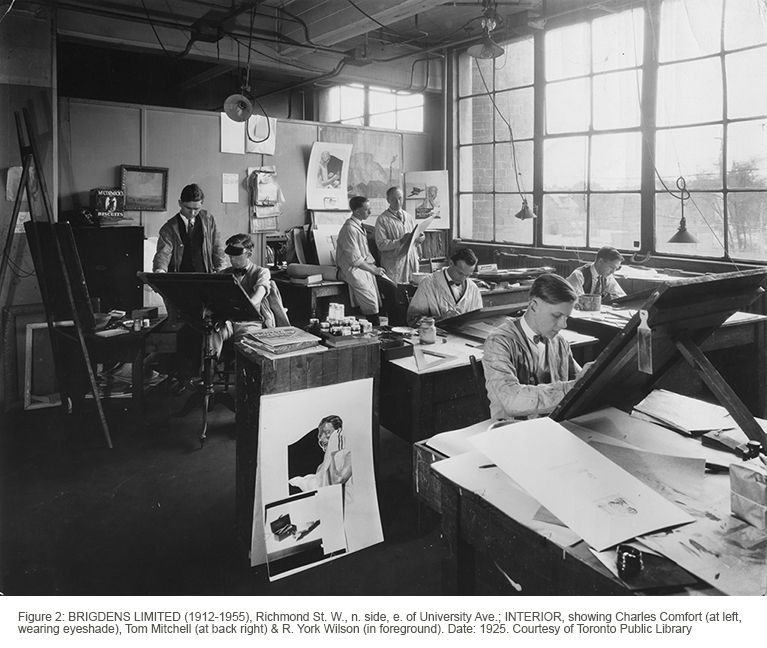 Once the photographic portrait of Queen Elizabeth was finalized, preparation for the bank note began at the British American Bank Note Company. 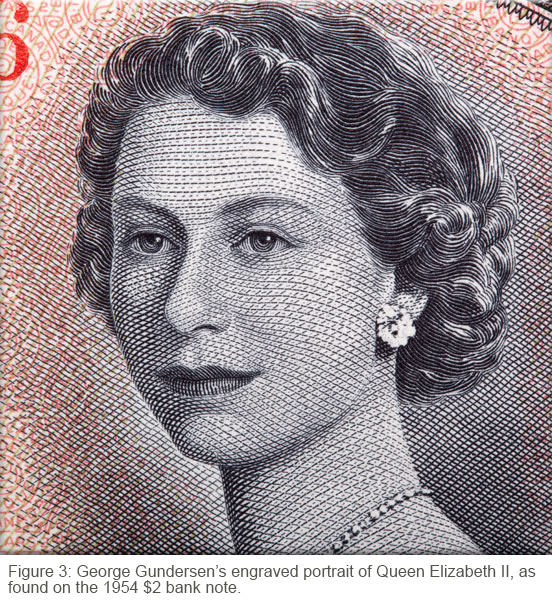 Art Director George Arthur Gundersen was given the task of recreating the portrait as an engraving for the final bank note production.4 Gundersen’s engraving reveals a detailed replication of the retouched Brigden’s portrait, with no sign to modification of the Queen’s hair style (Figure 3). 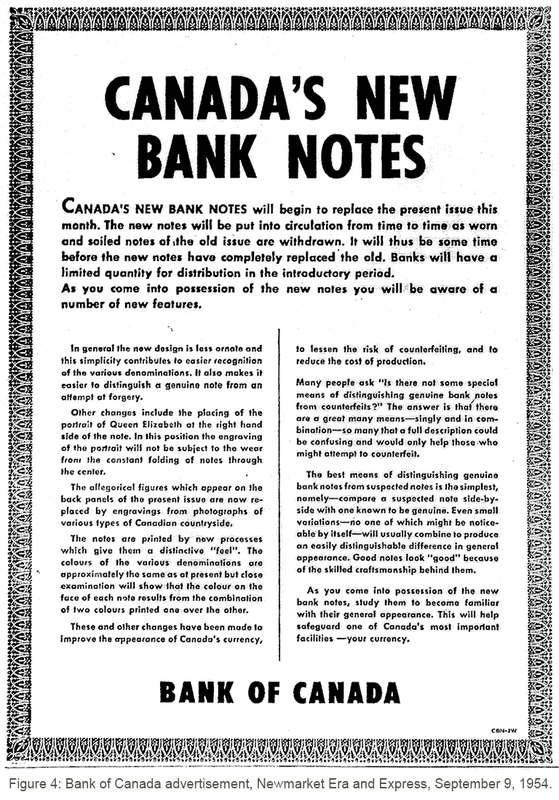 With confirmation of the bank note series’ design, production of the paper money began in early 1954 at both the American Bank Note Company and the Canadian Bank Note Company.5 The Bank of Canada notified the Canadian public of their release, in some cases by way of newspaper advertisements, such as this one from the Newmarket Era and Express dated Thursday, September 9, 1954, highlighting the change in design and additional security features (Figure 4). 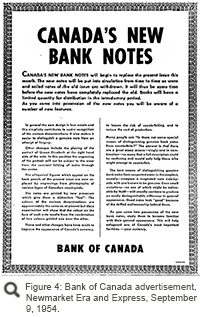 With little media fanfare, the portrait on the 1954 notes was modified by engraver Yves Baril of the Canadian Bank Note Company. 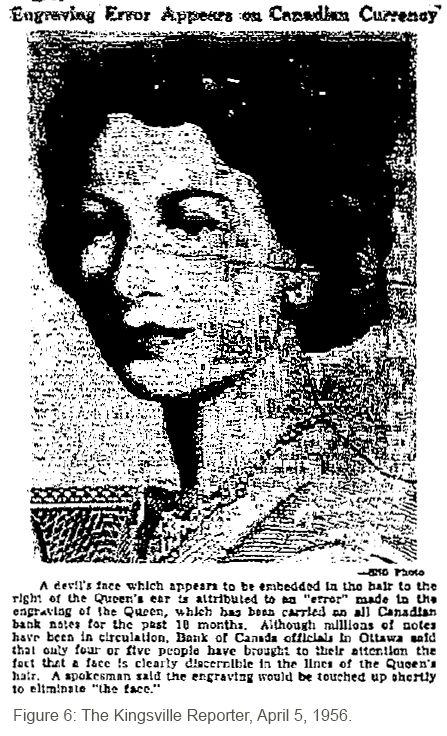 The highlights found in the Queen’s hair were darkened, erasing any sign of the devil’s face, as noted in the July 4, 1957 issue of the Ottawa Citizen (Figure 7).8 With this new engraving, modified banknotes were issued by the Bank of Canada; however, the original 1954 notes were never recalled and remained in circulation. 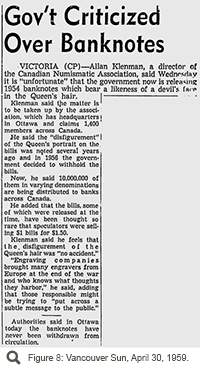 Discussions of the Devil’s Face bank notes appear to have subsided in 1957. Newly issued modified portraits were brought into circulation, and no further media comments appeared. 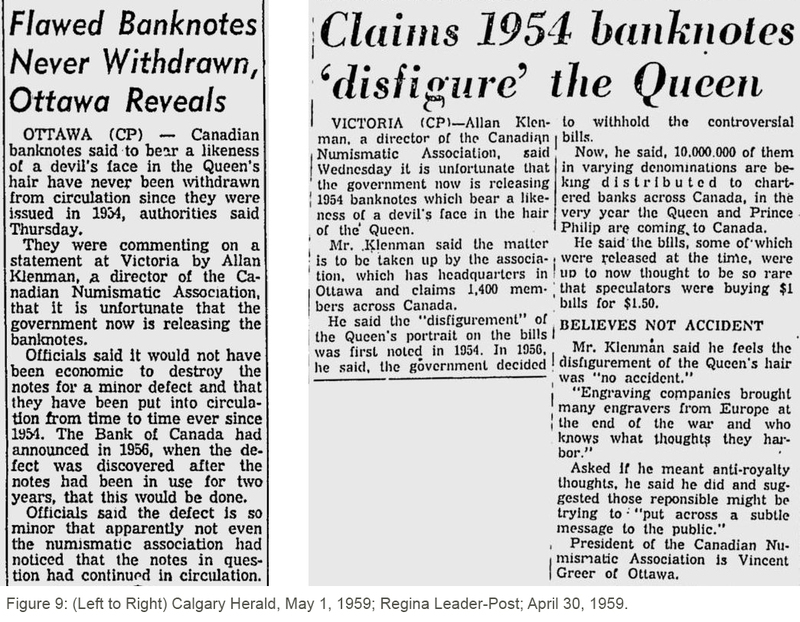 The notion of a controversy did not surface again until April 30, 1959, almost two years after the Ottawa Citizen article. An article by The Canadian Press cited direct quotes from Mr. Allan Klenman, a Director of the Canadian Numismatic Association, and the debate began (Figure 8). Klenman’s commentary of the devil’s face notes was motivated by his feeling that the “disfigurement of the Queen’s hair was ‘no accident.’”9 To further his position, Klenman goes on to elicit the idea that “’Engraving companies brought many engravers from Europe at the end of the war and who knows what thoughts they harbor’…that those responsible might be trying to ‘put across a subtle message to the public.’”10 This is the first mention in the media of a conspiracy associated with the devil’s face image. The story was picked up by the Calgary Herald and the Regina Leader-Post, disseminating the notion that an insider had infiltrated the engraving process to intentionally deface the image of Canada’s monarch (Figure 9). Through in-depth analysis of primary sources of the time, it is evident that the devil’s face occurred by sheer coincidence. 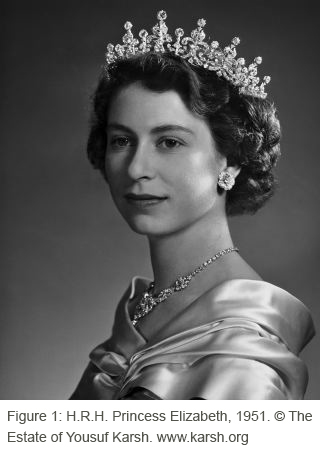 In looking at the original Karsh photograph, the highlights in Queen Elizabeth’s hair are the same as those that appear in the engraving, and could ultimately be interpreted as a devil face by some. The exacting reproduction by Gundersen is only a testament to his outstanding artistic skill, as evidenced by the meticulous reproduction of subtle nuances in the monochromatic portrait. If not for the discerning (and imaginative) eye of four or five sources who registered the issue with the Bank of Canada, this “controversy” may never have been brought to light. 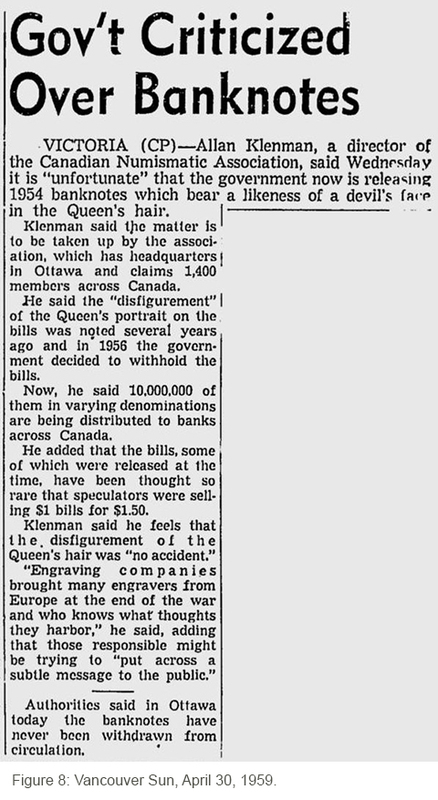 As for Klenman’s statement of European engravers with ulterior motives, it should be noted that George Gundersen was born a Canadian citizen and lived in Ottawa for most of his life.11 As a noted figure in the numismatic community, perhaps Klenman sensationalized the story to enhance the collector value of the 1954 bank notes, giving rise to a fable that still remains today. The truth about the 1954 devil’s face series of notes is that it is a classic example of the circumstances that can make a ‘collector’ item, which follow the most basic rules of supply and demand economics. The supply of these notes was cut short by the Bank of Canada’s action to modify the portrait in the first place, thereby forestalling what would have certainly been a very long and prolific series of banknotes. Also, the perceived controversy of the devil’s face itself, whether created or merely highlighted by individuals such as Allan Klenman, brought the notes into the public eye, thereby creating a demand. These two factors have served not only to increase the value of the 1954 devil’s face series, but to create a ‘must-have’ category of banknotes for any serious collector of Canadian currency. 1 The Estate of Yousuf Karsh, http://www.karsh.org/#/the_work/major_sittings/. October 25, 2012. 2 National Currency Collection – Bank of Canada/Collection national de monnaies – Banque du Canada, October 25, 2012. 3 National Currency Collection – Bank of Canada/Collection national de monnaies – Banque du Canada, October 26, 2012. 4 Graham, R.J., ed. Canadian Government Paper Money: A Charlton Standard Catalogue. North York: The Charlton Press, 2012. 243. 5 Graham, R.J., ed. Canadian Government Paper Money: A Charlton Standard Catalogue. North York: The Charlton Press, 2012. 243. 6 Toronto Daily Star, March 27, 1956. 7 The Kingsville Reporter, April 5, 1956. 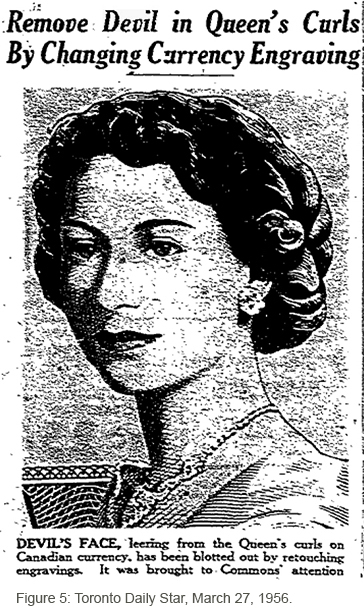 8 Ottawa Citizen, July 4, 1957. 9 Vancouver Sun, April 30, 1959. 10 Vancouver Sun, April 30, 1959. 11 Library and Archives Canada. George A. Gundersen Fonds: Biography/Administrative History. http://collectionscanada.gc.ca/pam_archives/index.php?fuseaction=genitem.displayItem&lang=eng&rec_nbr=157660&back_url=(). October 26, 2012.